The failure has been described as the largest ever in the UK aviation sector. MONARCH AIRLINES CEASED trading today, triggering a move by the British government to bring home 110,000 customers stranded abroad. The British airline and its holidays business entered administration, with KPMG appointed to oversee the financial chaos. The UK’s Civil Aviation Authority described the situation as “the biggest ever UK airline failure”, adding that “all future holidays and flights provided by these companies have been cancelled and are no longer operating”. 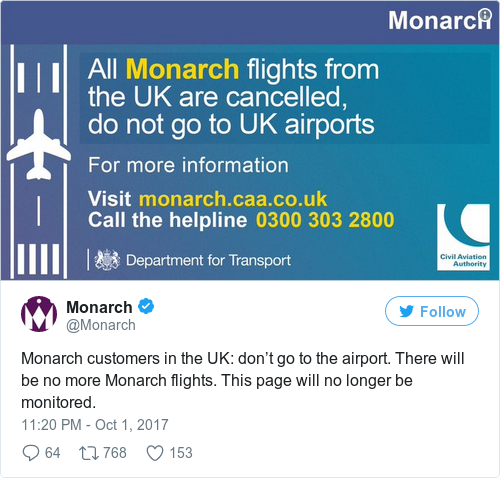 It added in a statement that “the government has asked the CAA to support Monarch customers currently abroad to get back to the UK at the end of their holiday at no extra cost to them”. The government meanwhile said that it was overseeing what it said was the biggest repatriation since the end of World War II. “This is a hugely distressing situation for British holidaymakers abroad and my first priority is to help them get back to the UK,” transport secretary Chris Grayling said in a statement. Monarch's website is showing this message this morning. KPMG partner and joint administrator, Blair Nimmo, said “mounting cost pressures and increasingly competitive market conditions in the European short-haul market have contributed to the Monarch Group experiencing a sustained period of trading losses”. Consequently, more than 2,000 Monarch workers now risk losing their jobs. The airline had been struggling financially for a while and won a cash injection a year ago that allowed it to continue flying holidaymakers and fund growth plans, as the sector faced turbulence from Brexit and terrorism. Majority shareholder Greybull Capital had pumped another £165 million (€187 million at today’s rate) into Monarch in October 2016 to allow Monarch to retain its licence to carry on selling package holidays. But the CAA has now decided against renewing the airline’s licences following expiry at the end of September. Extension of the group’s membership in the Air Travel Organiser’s Licence (ATOL) – a scheme funded by the sector that compensates travellers in the case of a company collapse – had been on condition of fresh funding. Monarch, based at Luton Airport, north of London, had meanwhile been due to take delivery of the first of 30 Boeing 737 MAX-8 aircraft in 2018. Note: This article has been updated to include additional information.